Lightsabers are one of the most iconic items in all of the Star Wars universe, and lightsaber duels are some of the most memorable moments in movie history. But how much do you really know about lightsabers? I spent some time researching to see what interesting facts I could find, and to answer some questions that you might have. If you have more, leave them in the comments! Lightsabers can be many colors, but blue, green, and red are the most common in the movie franchise. A lightsaber's color is determined by the type of crystal that's used to power it. Kyber crystals, which grow in crystal caves on the Outer Rim, were traditionally used to build lightsabers, but because of their scarcity, other types of gems have come into use. For example, the Sith use synthetic crystals that become superpowered when infused with the Dark side of the Force, sometimes even allowing them to break Jedi lightsabers. The fact that two crystals are needed can also affect the color of the blade: Galen Marek, protagonist of The Force Unleashed, combined a green and a blue lightsaber crystal to get an aqua-colored blade. In comics and video games, there are many different colors—amber, magenta, silver, pink, bronze, brown, yellow, copper, and a single known black one, seen below (this is the Darksaber, which appears in Clone Wars). There are even sabers that have one color on the outer edge of the blade and another in the core. Long ago, the color of a lightsaber indicated a Jedi's role: blue sabers belong to Jedi Guardians, who were focused on the "physical" side of the Force, and highly trained in combat. Green sabers were wielded by Jedi Consulars, who spent more time meditating on the mysteries of the Force. And yellow lightsabers were the choice of Jedi Sentinels, who used a balanced approach to their training in both combat and scholarship. 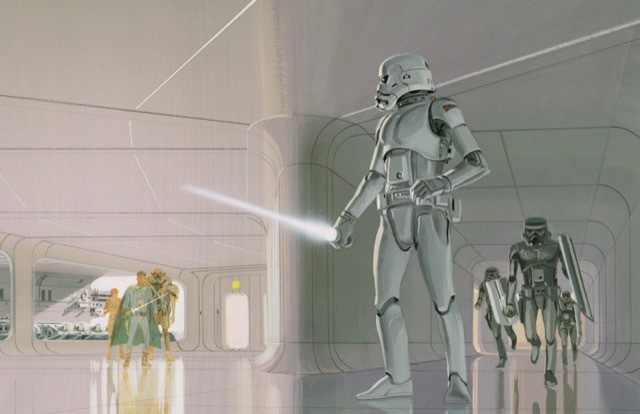 Originally, George Lucas intended lightsabers to be white, and for many of the characters in the movies, including stormtroopers, to carry them. They evolved over different editions of the script to become what they are today. Interestingly, Luke's second lightsaber was originally intended to be blue. However, it posed difficulties during the Sarlacc fight scene, as it kept getting lost in the sky—thus, his second saber became green. Do Other Weapons Use the Same Technology? Lightsabers, being some of the most powerful handheld weapons in the galaxy, seem very likely to inspire other types of weapons. And indeed they have. 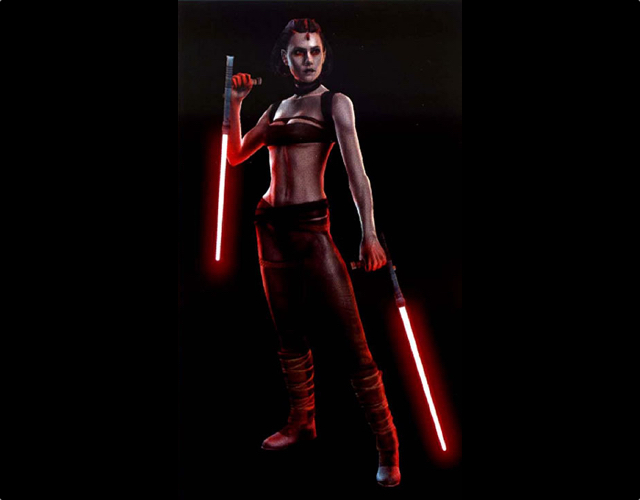 For example, the Dark Lady Lumiya in Legacy of the Force used a lightwhip, a whip covered in lightsaber crystals—she even managed to subdue Luke with it, and Luke needed to craft a second, shorter-bladed lightsaber to eventually defeat her. You might be surprised to know that Kylo Ren's "crossguard" lightsaber actually isn't a different type of design. In fact, the crystal in his lightsaber is cracked and puts out an immense amount of power, which necessitates the use of vents, giving the appearance of a crossguard. It also accounts for the unstable look of the entire blade. Beyond unique lightsaber designs, kyber crystals have been used to power other weapons. Ancient Sith superweapons, for example, were powered by kyber crystals. The Death Star's superlaser was partially powered by kyber crystals, and it's possible that they were used in the creation of Starkiller Base, as well. This possibility is supported by the fact that some of the First Order's weapons, including the turbolasers on their Star Destroyer Finalizer, are enhanced with natural kyber crystals. Why Do Lightsabers Sound Like They Do? Moving out of the Star Wars universe itself, the sound of the lightsaber is one of the most distinctive in movie history. Few other sound effects have had such an enduring place in our memories (so much so that Ewan McGregor actually made lightsaber sound effects while filming The Phantom Menace, even after George Lucas told him that the sound crew would add those effects later. His response? "I keep getting carried away"). But what is that sound? The base sound, you might be surprised to learn, began with the sound of old movie projector motors. The sound of the motor was combined with the sound made when a TV set interfered with a shieldless microphone, and the sound of the lightsaber was born. The characteristic changes in pitch were made by playing the base sound over a loudspeaker and moving a microphone back and forth in front of the speaker, simulating movement of the blade. Which Disciplines Influence Lightsaber Duels? In the original trilogy, George Lucas used a combination of Western and Samurai fighting techniques to influence the choreography of the lightsaber duels, which got faster and more intense as the series moved on. The prequel trilogy, however, was very much influenced by kendo, a Japanese martial art that sees two combatants facing off in a sword duel. I hope you learned something new from these facts, even if you're a lifelong Star Wars nerd (I certainly did). But what other questions do you have about lightsabers? Is there anything you've been wondering that you haven't been able to find an answer for? Post your questions in the comments and we and the community will try to answer them!